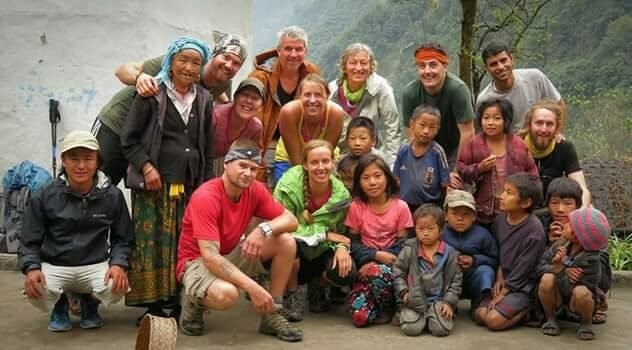 LATE OCT 2015 A TEAM OF INTREPID TREKKERS HIKE DEEP INTO THE FOOTHILLS BENEATH MT EVEREST TO SPREAD HOPE AFTER THE 2015 EARTHQUAKES. During the weeks following the 25th April 2015 earthquakes the Active Hearts team sent eighty 12 x 18m heavy duty tarpaulins to the Lower Solu Khumbu region, beneath Mt Everest. These emergency tarps were sent to Gudel, Cheskim and surrounds. 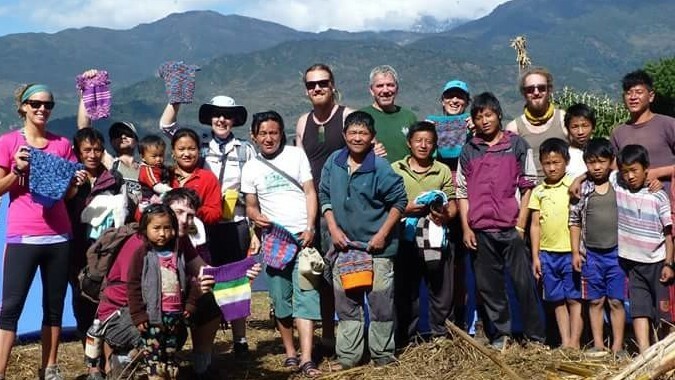 They were taken directly to families of guides and porters of ‘Active Adventures’ and their fellow villagers. 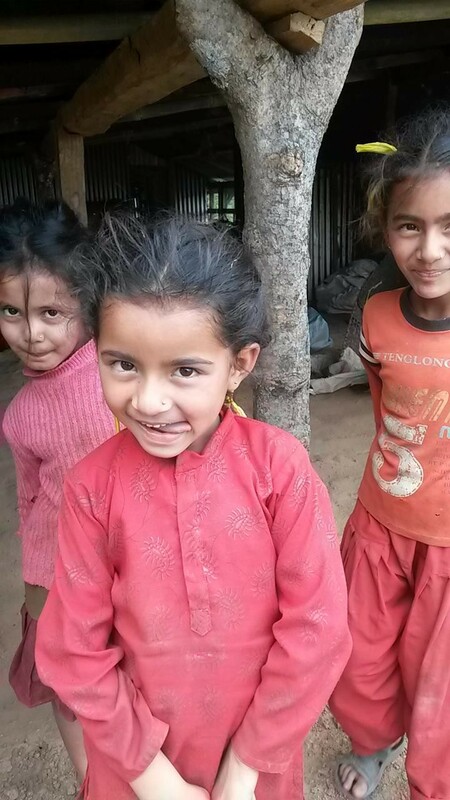 Dan and Arjun could not make the trip themselves at that time as they were fully occupied with emergency relief in central Nepal, but the seed of an idea was sown to visit the area and see how the people were coping at a later date. About July 2015 they started putting together the idea of a trekking expedition into the lower Everest region. The dates were set for Oct 27 - Nov 5th 2015 with a small team of invited internationals and locals. With the monsoon season well underway plans were being formulated to return to Nepal and continue to assist with rebuild and 'bounce back'. The expedition would involve local buses, jeeps, donkeys, a flight from Kathmandu to Phaplu and return from Lukla to Kathmandu; a lot of long distance hiking across the Himalayan foothills (mountains to foreigners!). 1. 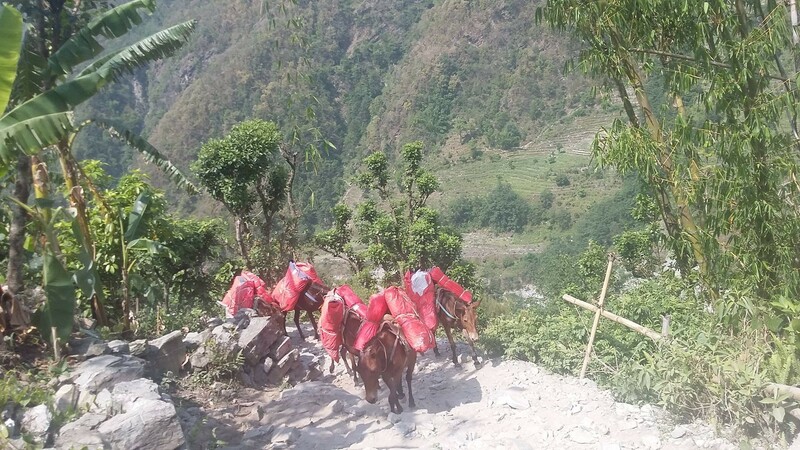 See how the our Active Adventures boys, their families and the villagers were faring post-earthquake/monsoon. 2. Provide medical assistance and to distribute supplies. 3. Meet with village leaders and discuss what assistance was needed and what is possible for ‘Active Hearts’ to provide. 4. Let our friends who are doing it tough out there know that we are here to help them get back on their feet. We would be in some beautiful places yet untouched by the hand of tourism whilst meeting and living with some of the most beautiful people on the planet. As with most journeys through Nepal, it was an amazing chance to see another approach to life and quite possibly a journey within as much as out. It would be challenging physically, emotionally and spiritually. 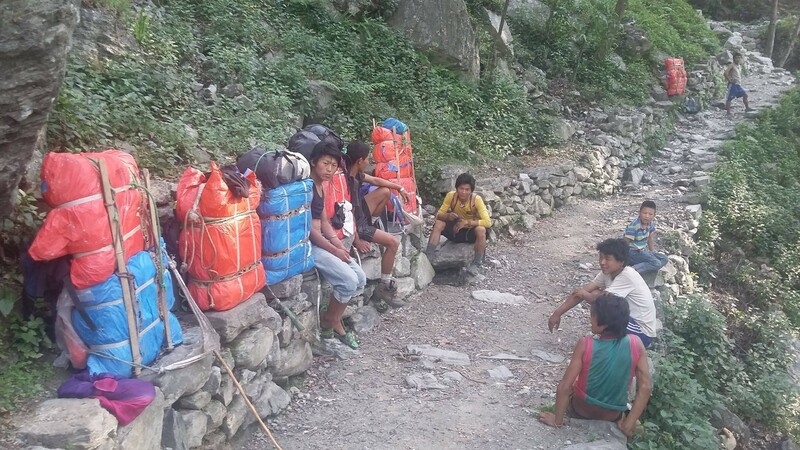 The crew flew into Phaplu, met our team of six Nepalis to help carry loads, bought all the dry food stock to take for the 10 day trek then headed off along the trail. Local paths led deeper into the foothills in areas rarely visited by foreigners. We were treated to hospitality unlike anything we’d experienced before. The people in this part of the world are the very essence of community. Electricity was yet to make an appearance. People wake before dawn and some have already pulled an eight hour day before lunch. However they appreciate the little things and always have time for their neighbour and the strange band of tall foreigners trekking through their villages. Three days of rugged trekking later we reached Gudel village. 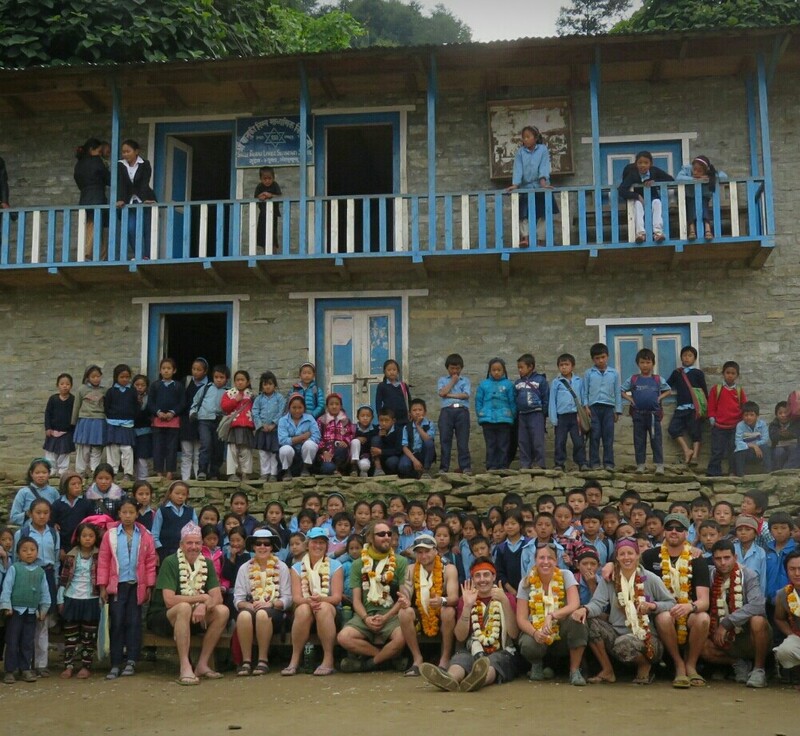 Home of Bebek, our lead assistant guide on our Everest treks, and many of our portering team. A beautiful little hamlet of very traditional Rai and Kulung homes nestled on the side of a deep valley looking directly up towards the Everest range of the Himalayas. The curious children huddled together at a distance as we walked in, not sure what to make of these alien intruders! Millet fields were cleared for our small tent city to be established. In the evening the local villagers gathered round and singing and dancing went on into the night. Ice broken, the kids were soon all over us! During the day the Active Hearts team were very spoilt by Shree Basuki Lower Secondary school and Shree Gudel Higher Secondary school. We were showered with beautiful Mala and flower leis, treated to traditional Rai dancing and shared many laughs. After consultation with the primary school principal a list was made of much needed books for the teachers to use in their lessons. These books were sent up a couple of months after the trek finished. This is a truly magical place. We built a fantastic giant bamboo swingball set and taught the children hopscotch. They treated us to a traditional feast of goat, dal, rice, vege curries and local millet wine. Our final night in Gudel we gave the village a little performance of our own. The boys threw down a haka led by Funky, the girls showed off some traditional Maori poi dancing and Kelsey and Kate did a little Alaskan native dancing. It was a night that will never be forgotten. 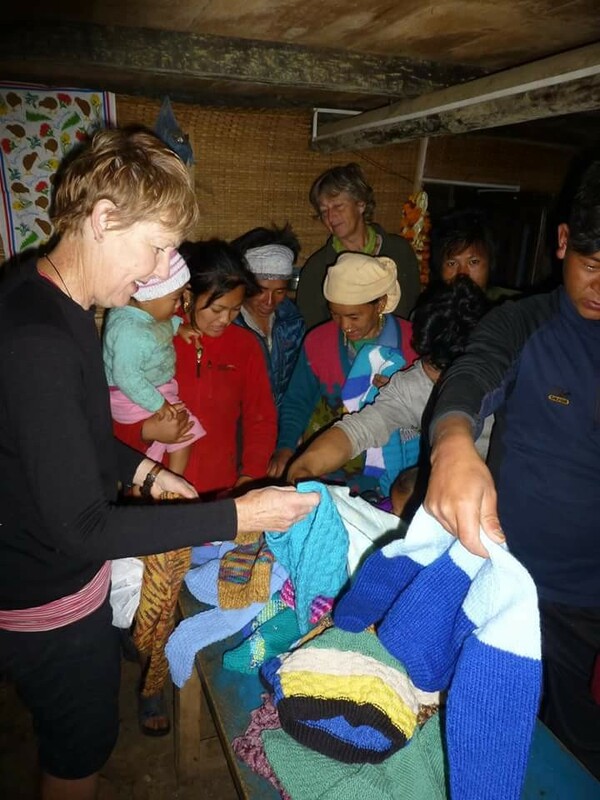 Before we departed we handed out dozens of handknitted jumpers and beanies lovingly made by Kath Wicks and her friends in New Zealand. The journey through lower Solu Khumbu was over for now but the memories would last a lifetime time. Dan and Arjun have spoken about another trip to Gudel and this magic part of the world in the near future…..watch this space, you could be on the team! Interested in Joining a Trek? Have a look here.